“Bauddhika”, the Annual Cultural Fiesta of Shanti Business School, is an event which is conducted every year for students of across India, to come, participate and enjoy a bunch of different activities, each more interesting than the other, and have a time of their lives. Each year, the response is huge and the crowd is always full of zeal. 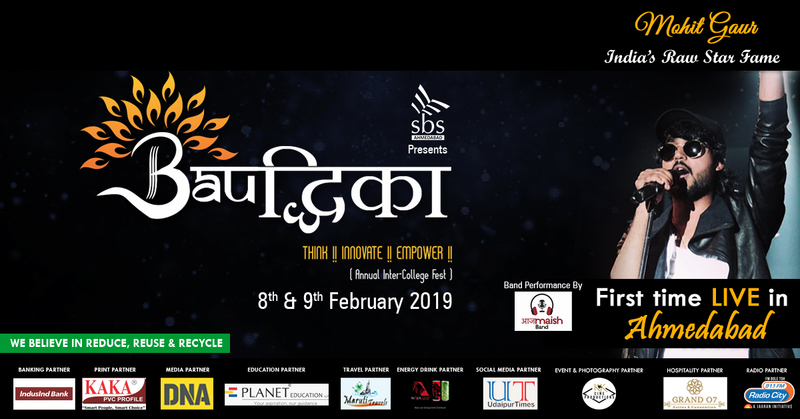 This year too, on 8th & 9th February, Bauddhika 2k19 is ready with 26 activities to welcome students to take the stage and show their talent to the world. Entry will be on production of a valid pass. NO RE-ENTRY IS PERMITTED. No entries are allowed after 7:30. The damaged pass will not be accepted. Please produce your pass on demand and retain this pass till the end of the concert. Please park your vehicle in the parking. Do not litter in the college campus. Management reserves the right to deny entry or expel a ticket holder for misbehavior. Please cooperate with the management committee. No drinking and smoking in the campus. Please maintain discipline throughout the event. No refunds on the purchased ticket are possible, even in case of any rescheduling. Rights of admission reserved, even to valid ticket holders. Security procedures, including frisking, remains the right of the management. No dangerous or potentially hazardous objects including but not limited to weapons, knives, guns, fireworks, helmets, laser devices, bottles, musical instruments will be allowed in the venue and may be ejected with or without the owner from the venue. The sponsors/performers/organizers are not responsible for any injury or damage occurring due to the event. Ticket holders in an inebriated state may not be allowed entry. Carrying of liquids, alcohol, cigarettes and banned substances are not allowed in the campus area. No tickets for the event shall be used by any person for advertising, promotional or commercial purposes, including but not limited to prizes, competition, contests or sweepstakes without obtaining the written consent of the promoter. Entry Restricted for Drunk People and also payment is Non-Refundable to such people. We are not responsible for any Natural Accident occur during this event. Note: 2nd & 4th Sat & All Sun off. Kindly provide below details to provide you more information about admission.